Published: Dec. 30, 2018 at 03:35 p.m. Published: Nov. 5, 2018 at 09:41 p.m. 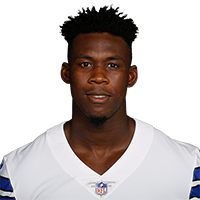 Published: Oct. 7, 2018 at 10:17 p.m.
Dallas Cowboys wide receiver Allen Hurns catches his first touchdown as a Cowboy on a 3-yard pass from quarterback Dak Prescott.